Ruby on Rails is like IKEA...whaa? Recently, I found reading an article by Paul Venezia titled, Fatal abstraction: A bottom-up view of high-level languages, where—if you read between the lines—you can see that Paul just found himself waking up from a coma and it’s no longer 2004. “I may have questioned Perl’s future now and then, and Perl certainly doesn’t have the presence it once enjoyed, but the strength of Perl has always been its flexibility. You can do pretty much anything with Perl, and you can do it in a wide variety of ways. Perl’s core revolves around the idea that there’s always more than one way to do it. In fact, there may be dozens of ways to do it. PHP shares a similar trait in that it gives you a large set of tools and leaves the construction up to you. Admittedly, perhaps I’ve been in drinking the “kool-aid” for far too long, but I thought this tired argument has run it’s course. Paul, I completely understand where you’re coming from. It sounds like you’re dealing with similar trust issues that I had nearly a decade ago. Trust me, it will be okay. Ruby on Rails isn’t magic. Behind the curtain you’ll find a collection of object-oriented code written in one of the most readable languages in existence. Over on the Planet Argon blog, you can read an enlightening interview with two of our Jr. Ruby on Rails developers. Both of them made a career change in their 30s and went through a coding academy here in Portland, Oregon. We’re all excited about the prospect of a new code editor (Atom Editor). We all love what Github has produced so far and our expectations for anything new are going to be quite high. Do we know exactly what it’ll be yet? Not quite. We have some hints… but until it’s released… we’ll continue to speculate. 1. Atom Editor will not make it easier to code while in the shower. While I would love to take advantage of putting my thoughts to code while letting my conditioner do it’s thing… I don’t believe they’re trying to solve this problem (yet). 3. Atom Editor will not bring synergy to developers. 5. Atom Editor will not bring about peace in the Emacs vs Vim wars. We are going to have to let them sort a peace deal on their own. 6. Atom Editor will not have integrated CVS or Subversion support when it is released. 7. Atom Editor will not promise the world to you like Visual Studio.NET did back in 2002. I remember their demo videos and it seemed like the development world was about to change! I never would have guessed that come 2005, I’d be in love with something as simple and fancy-feature-less as TextMate. 8. Atom Editor will not just be a clone of Sublime Editor. Github has too clever a team for that objective. What are you confident that Atom Editor will not be? Jim Weirich -- Farewell, Friend. Jim Weirich was building interesting stuff with Ruby several years before I was introduced to it. Tools that most of us have taken for granted. Tools that were just there. Before Jim came along… they didn’t exist. Back in the early Ruby on Rails explosion era (circa 2004-2006), it was much easier to get to know the great Rubyists. 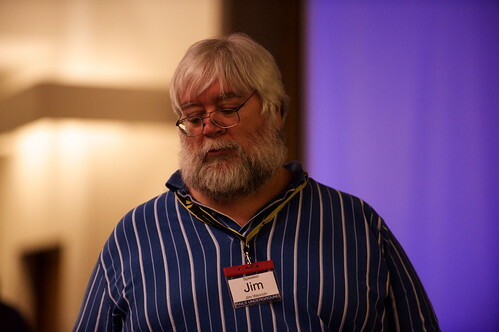 I remember finally getting a chance to meet Jim (and _why) at FOSCON here in Portland, which still goes down as one of the best “conferences” I have ever attended. Jim spoke at a ton of conferences. At any conference that I seemed to get invited to speak at… Jim seemed to always be on the speaker list too. We’d end up meeting up on the conference circuit a several times over the coming years. It was always a delight to catchup. I believe the last one was in 2009 at Rails Underground in London. I remember walking in one of the rooms and spotting Jim. There he was… waiting patiently for his time slot… sitting by the wall in another horribly uncomfortable conference chair… hacking away on his laptop as if he was on a mission to save the human race. In reality, he was probably toying around with some new idea. It’s people like Jim that helped me feel like I had something valuable to contribute to the community. The mere fact that he knew who I was, that he commented on my silly blog posts, referred potential customers to me, showed up for and complimented me on my talks, asked ME for advice on IRC, wished me a happy birthday on Facebook, responded to my lazy tweets… made me feel like I was welcome to (and part of) the party. A party that started a number of years before I showed up. Let us raise our glasses high and thank our host for the pleasure of being amidst his most generous company. Thank you, Jim, for helping me learn more about myself. I only wish I had gotten to know you more. 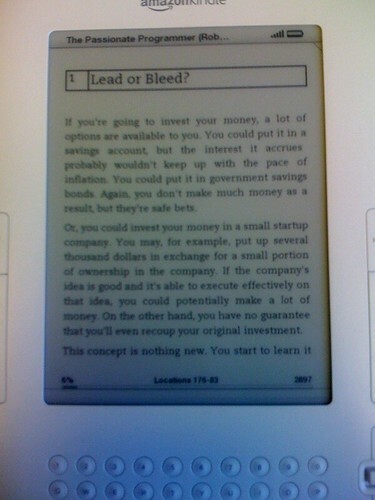 Last month I picked up a new kindle from Amazon and have been reading a handful of books. One book that I’ve been really impressed with is Chad Fowler’s new book, The Passionate Programmer. I plan to post some more thoughts in upcoming articles, but wanted to share this gem. Sometimes we feel stuck, but that doesn’t stop us from stepping to the side and assessing the situation. There is always something useful that we could be doing right now.